The world famous Harlem Globetrotters were in Minneapolis, Minnesota at the Target Center and AirVuz got the unique and exclusive opportunity to film a couple of the players performing some of their trick shots in a way that has never been attempted before… with a first-person view drone. The goal of the shoot was to get one continuous, epic shot filmed with a FPV drone. With limited time available on the baskeball court, we knew it had to be perfectly choreographed. We called in the help of Team AirVuz pilot and the most recent FPV pilot to join the Drone Racing League, PhluxyFPV. Geared with a GoPro HERO7 attached to his Shendrones Squirt V2, Phluxy was able to maneuver around the Globetrotters as they passed the ball and performed tricks. Starting with Zeus’ signature half court granny shot, the drone actually flies between his legs and follows the ball to the hoop. 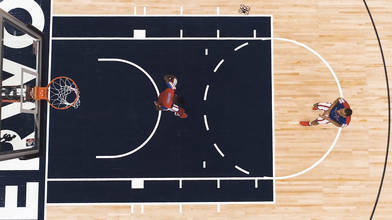 From there the drone captured the Globetrotters in their magic circle and eventually capping off the shot with a slam dunk. The Harlem Globetrotters are used to performing tricks under pressure, but this was definitely a first. Dragon is actually a drone pilot himself, flying a DJI Mavic Pro, but he may soon be setting his sights on a FPV drone. To see more or learn about the Harlem Globetrotters, head to https://www.harlemglobetrotters.com/.